This will be short post – I swear. Maybe only six or seven paragraphs. The Burning Man event has a greeting for everyone as they arrive on the Playa – “Welcome Home.” Arriving back in La Cruz feels like that to us, a feeling not at all hurt by making it to the anchorage in time for Happy Hour at the Huanacaxtle Bar and Cafe. Nothing to make you feel welcome like a hug from the owner when you walk in after a 5 week absence. After some 10 peso draft beer we wandered the familiar streets, at some street tacos (although not at our favorite taco stand because we were a bit too early for them) and headed back to the boat to call it an early night. After a 30 hour passage to reach La Cruz and no nap after dropping the hook (which we positioned just about perfectly on our first try, no mean feat with 60 boats in the anchorage by my count) we were ready for some sleep. Part of our reason for heading back to Mexico was to see if I could jump on a boat for some racing in the Banderas Bay Regatta. Of course, I didn’t realize that there were two regattas, and first one, MEXORC being the serious race boats. I thought it would be over by the time we got here, but it turns we arrived on a lay day and there are three more days of racing. I’m about to go walk the dock and see if anyone needs some crew. If not, I’m sure I’ll be able to some crewing in the Banderas Bay Regatta, which is much less serious but more of a for fun type racing. Please need crew, please need crew! After all the fun, it will be time to get to work. Jenn is working up a list of boat projects, and I’ll spend a few days trying to cross items off the list. Once we get some work done, we’ll start the trek north we some new and old stops planned along the way. Banderas Bay has quite a bit supplies available so hopefully we can find the bits and pieces we need for the projects, and any other random items we need. Time to dig out my racing gear and hope one of these very fast looking sailboats needs an extra hand, even if it just to sit on the rail and be heavy. Everyone has to have a talent. 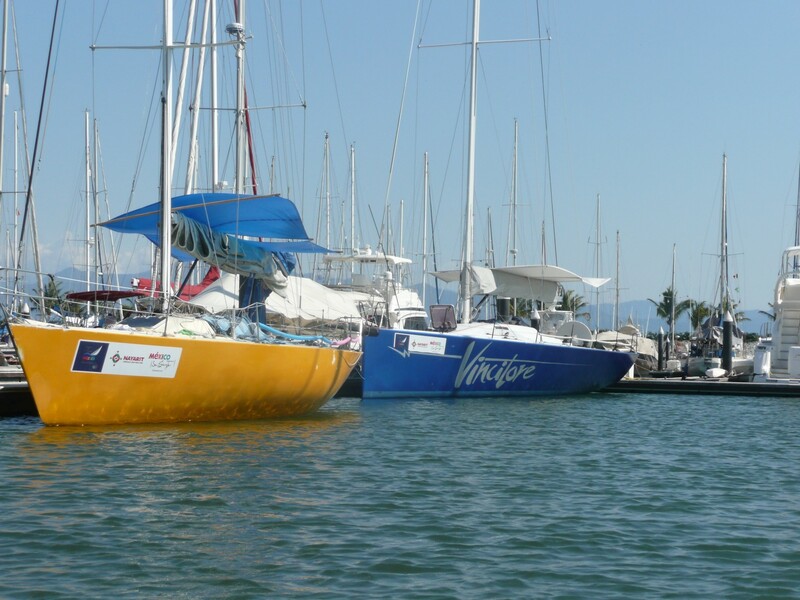 This entry was posted in Mexico and tagged banderas bay regatta, La Cruz, MEXORC, sailboat racing by Erlin. Bookmark the permalink.